This Halloween, put away the princess dresses and police uniforms and bring out what the holiday is really about: scary monsters. Let’s take a look at 10 costumes that’ll transform your pup from beloved family member into spooky nightmare. This zombie look requires a lot of costuming skill, but if you pull it off, your dog will look so dead even Rick Grimes would be left shaking in his blood-splattered boots. Dragons are definitely trendy this year. Embrace your inner Khaleesi by adding a few scales and a set of wings to your most loyal subject. Your dog might not breathe fire, but a gust of hot, smelly dog breath is sometimes just as scary. 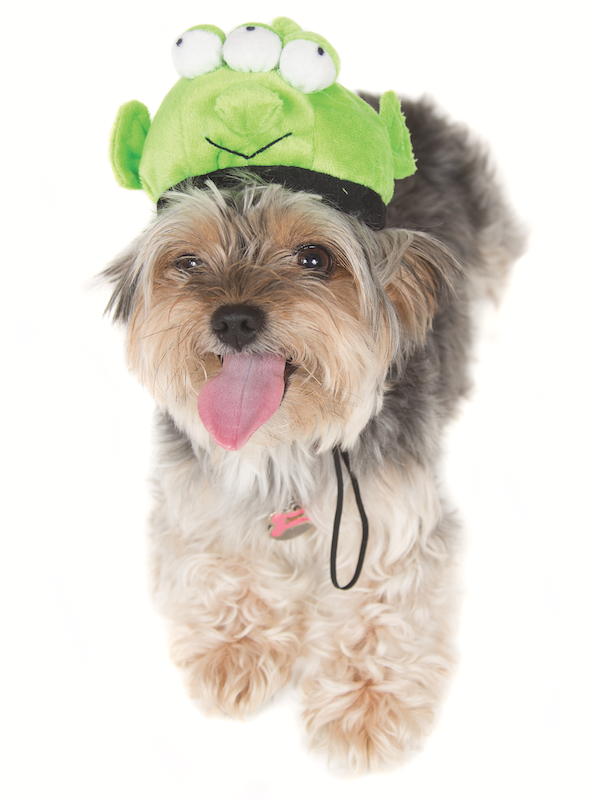 Practice for an extraterrestrial takeover by wanting to believe in your alien-disguised pooch. They’ve already got the pointy teeth, so turning your pup into a vampire is a relatively easy makeover. A high-collared Dracula cape is essential to this look — we’re going for classic, not Cullen. Unleash your creativity with this comic book-inspired look. Add some limbs, an extra head, wings, super specific superpowers, whatever. Give your mutant mutt an origin story to rival Wolverine’s and, who knows? Maybe the next X-Men movie will feature a canine cast. Pretend you’re John Hammond, and bring the T-Rex back to life in doggie form — but have your escape helicopter on standby when this beast gets hungry. 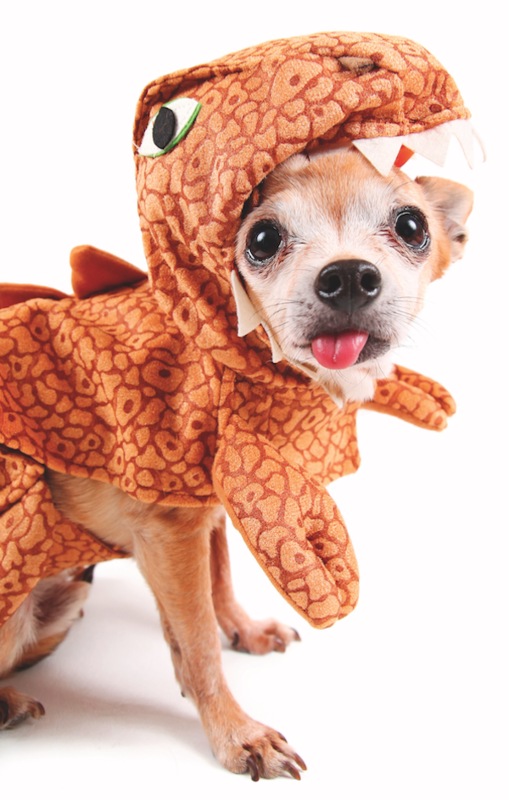 This mythical creature is a great costume choice for water-loving mutts. A word of warning, though: This look is not Instagram friendly. All photos will be out of focus, and your friends might mistake your dog for a log. A big green forehead and a bolted neck isn’t what Mary Shelley imagined, but this look is certainly synonymous with the modern monster. Your dog may not stand out from the costumed pack much, but he will rekindle fright in anyone who thought they could skip the reading in English class. 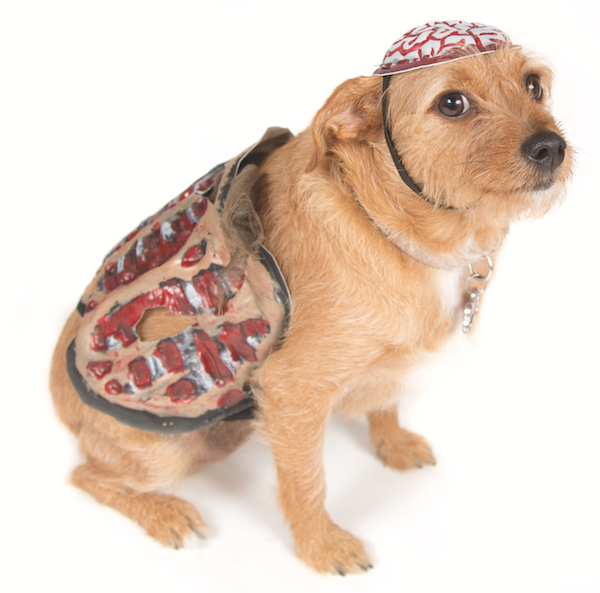 If your pooch is a shredder, you’ve already got the makings for this Halloween look. Get those ripped up bed sheets and blankets out, and wrap your destructive pooch in his own handiwork. 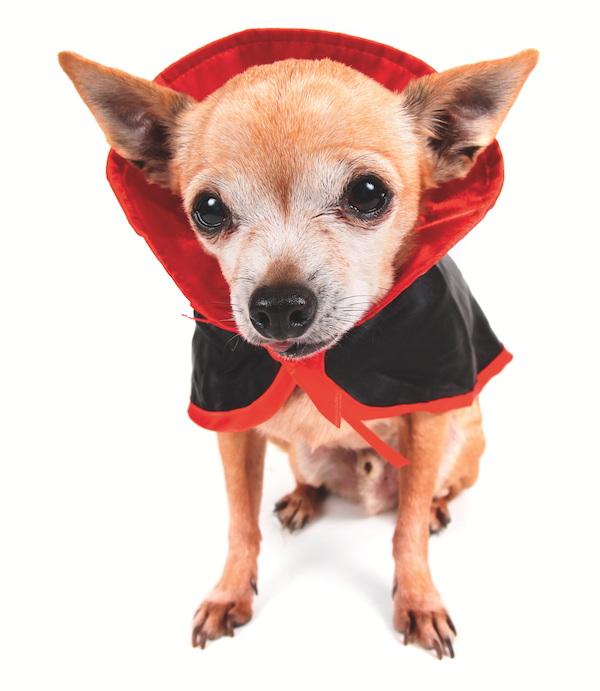 If Halloween might need to be more about family fun than fear this year, there are plenty of furry, friendly monsters your pooch can channel. Just remember, if you dress your dog as Cookie Monster, you must provide him with plenty of dog cookies. It’s a fair exchange for his dignity. Take note: The comfort of our little mutt monsters is the priority during any Halloween activity. 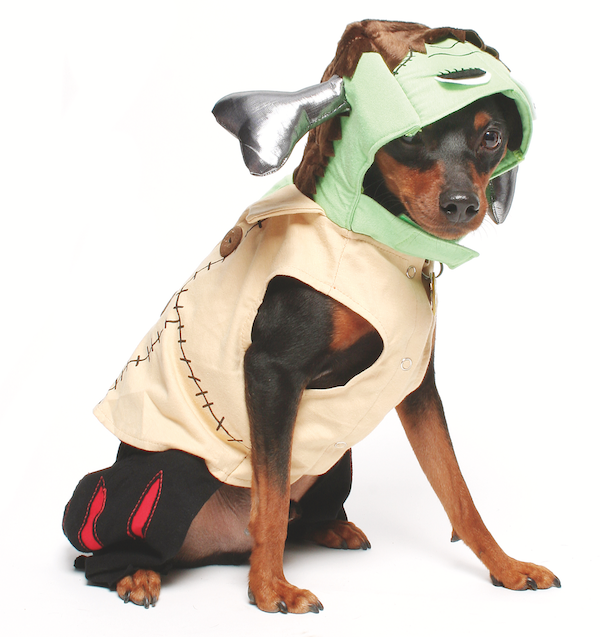 We want them to be scary, but not scared, so take cues from your pooch, and let him ditch his outfit if needed. 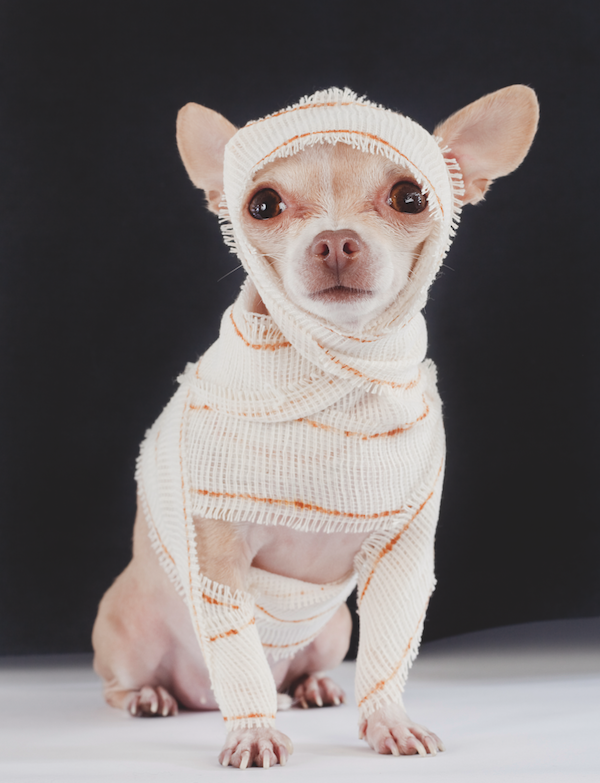 Even naked, dogs won’t be deterred from celebrating tricks and treats. The post Turn Your Dog Into a Monster — a Cute One! — for Halloween appeared first on Dogster.